Industrial alcohol for general purpose cleaning and thinning some spirit based paints and French polish / knotting products. Hazard safety codes: F, Xn, R11, R20/21/22, R68/20/21/22. 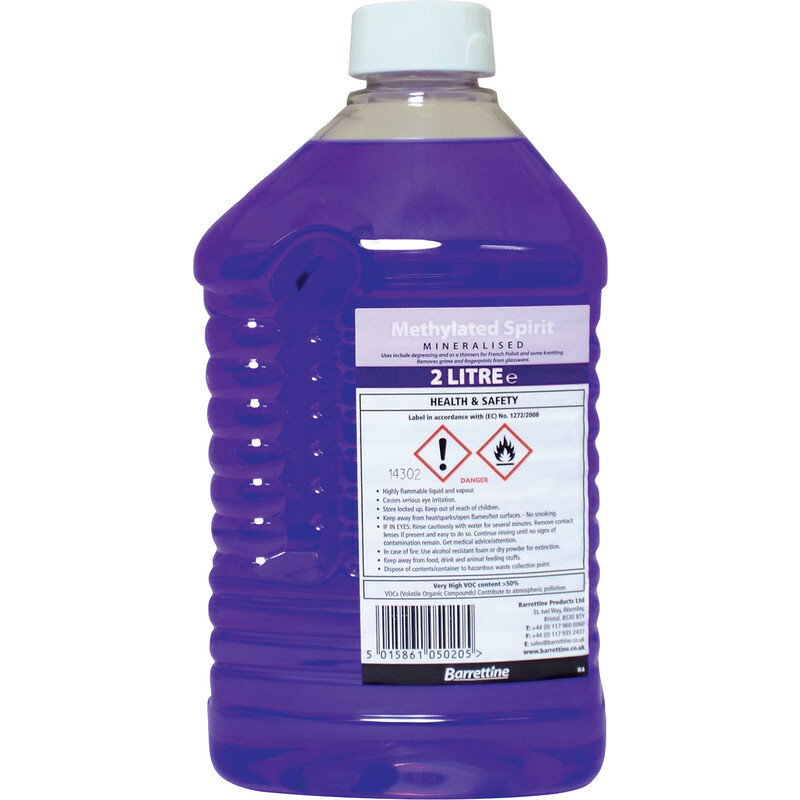 Methylated Spirit 2L is rated 4.9 out of 5 by 17. Rated 5 out of 5 by Jonma from As Expected It arrived well packaged and not leaking. Container is thin clear plastic and not as robust as previous purchase from Toolstation. I need it for use in a meths burning stove and decant the meths in to a “Trangia Fuel Bottle with Safety Valve”. These are robust purpose built for pouring meths with a locking push button safety valve/filler pourer top. i would recommend them if you need to transport the meths or use it for heating/ burning. Rated 5 out of 5 by JRB42 from Great for cleaning brushes Needed this product to add to the shellac, also to clean brushes, did a great job. Rated 5 out of 5 by Jimmytheone from Buy this larger size it cost lesson the end. Good product and price, great for a multitude of cleaning jobs & also an emergency cooking source with my ancient camping stove. Rated 5 out of 5 by Tonythedeckie from Excellent Value It is what it is and have not seen cheaper. Rated 5 out of 5 by cleansweep from Excellent product Good product. Lovely colour. Shame it is not supplied with a couple of straws so you'll have to supply your own - Umbrellas are optional!! Rated 5 out of 5 by Analyst from Good value A good value product and works well.